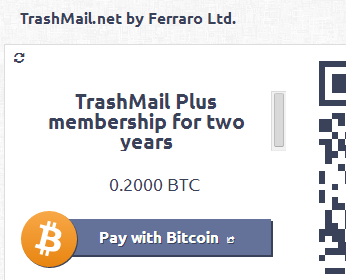 I tried to get a 1 year trashmail plus subscription and wanted to pay with bitcoins, but it looks like the ripple payment site on trashmail ( https://ssl.trashmail.net/?cmd=register ... X&extend=0 ) is broken since about 1 week. XMLHttpRequest cannot load https://blockchain.info/receive?method= ... id%3D27136. Origin https://ssl.trashmail.net is not allowed by Access-Control-Allow-Origin. I will contact the support of blockchain.info. The Bitcoin payment has been fixed. BitPay has been implemented as payment system. Admin wrote: The Bitcoin payment has been fixed. BitPay has been implemented as payment system. It asks for a fixed amount of Bitcoins, currently more than ten times the subscription price. LOL. The problem is that the API of Bitpay needs a fixed Bitcoin price and then it generates an "encrypted" string. I would have to re-encrypt it all the time as Bitcoin currency is exploding and going down all the time. Anyway: The Bitcoin mining price is much lower than its market price, so for the moment yes please pay in Euros as long Bitcoin is over-valued.